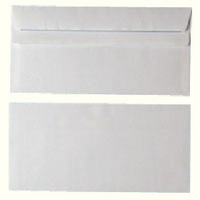 Plain white envelopes. Crisp 80gsm white paper. Self-adhesive flap. Suitable for A4 documents folded into thirds. Size: DL. Pack of 1000. Approx Dimensions (CM): D12 W26 H45. Approx Weight (KG):4.59.